Something happened during last month and although I have been writing a lot, I just couldn't post anything. Maybe this is what one would call “blogger’s block”, I am not sure. What I do know is that talking about it made it somehow a reality, which mysteriously led to its disappearance. I have not analysed what happened or how the situation sort of resolved itself but to the three friends who helped, let me say, I am grateful. Back to the everyday life, in the midst of researching anthropological theories, my mind always goes back to food. I am cooking a lot these days and enjoying every second of it. I finally cooked the squash! It was quite a feast; I will soon write more. Also, a few months ago I “discovered” a new ingredient. Fasting for Easter, it seemed like the right timing to experiment with tofu. As I read, tofu needs to release its water in order to gain a nice texture and absorb all the flavours. Place it on a plate, with some kitchen paper. On top, place another plate with something heavy on top, pushing it down. Slowly the tofu releases a lot of water (this is where the kitchen paper comes in handy). Then get your wok ready and hot. 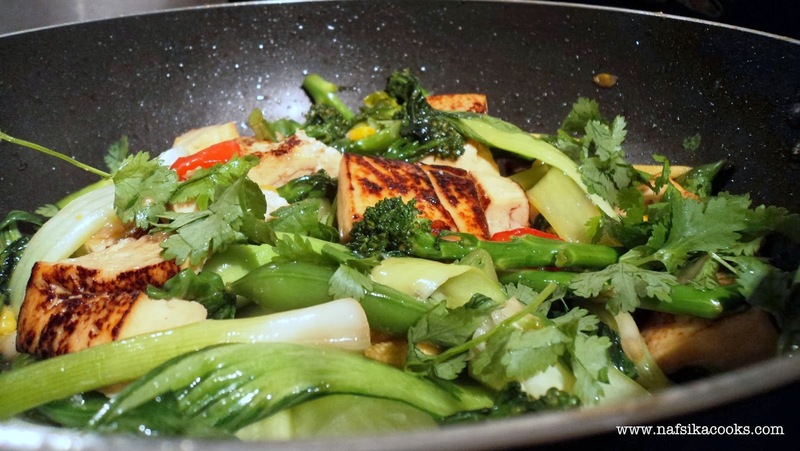 With some oil, I stir fried some vegetables, including pak choi, my new favourite ingredient here in London and then the tofu, cut in cubes. I used a glaze some friends had brought from Wagamama’s and it really was marvellous. Seems easy to make (the glaze) with soy sauce, rice vinegar and sugar. Yummy! I still feel though that I have not conquered the art of stir frying. I know it needs very high heat and to move everything around, using small quantities so that vegetables do not start steaming or boiling. Maybe I am missing a gas flame? When I go back to my parents’ house I will definitely try it there. Gas beats electricity anytime. So, back to the stir-fry, I think this glaze makes everything delicious, I will definitely try to make it at home. 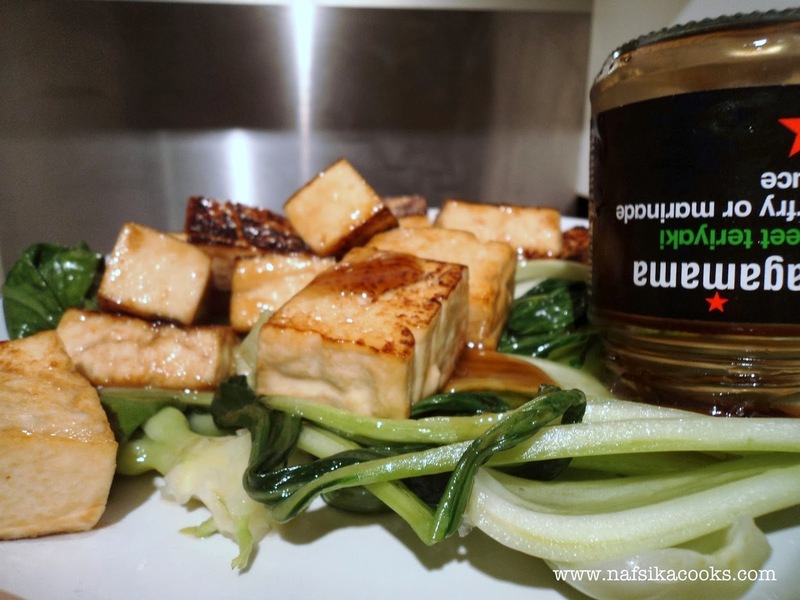 The tofu was relatively firm and it absorbed the flavours. It even had a light crispiness on the exterior. However I was not amazed. I had high expectations as friend K had once told me that she specifically uses it for its texture, often along with chicken or beef. However, this sort of rubbery inner texture did not satisfy me. And I am not comparing it with some other ingredient; that would be unfair (we only compare apples to apples, as we used to say at my first job). But there was something about this texture which felt highly processed, very unnatural in a way. Of course the cubes were “playful” (you know, a food with its main ingredient in identical cubes is always fun), they looked good and the dish can stand on its own, I will give you that. It is very, very filling, much more than what I expected. This whole experience made me wonder though. When cooking something new for the first time it is really hard to decipher how one feels. Did I not like tofu because, well, I didn’t like its taste? Or was it my cooking which was not good? Was it something in the ingredient itself or was it my lack of experience with it? Wouldn’t it be amazing if there was a book, for beginners which would explain, using as many descriptive adjectives as possible how something is “supposed to be” when cooked? And before you object dear reader let me clarify: of course in cooking there is no “supposed to be” and that is the beauty of it. I personally find that burned chicken wings taste much better than the perfectly cooked ones. Still, I feel this would be useful as a benchmark, something to start with and from which, later on you can derail and create the most amazing burned food. I am asking friends at the moment: do you cook tofu? Do you like it? How do you make it? What is it supposed to taste like? Well, for you at least. 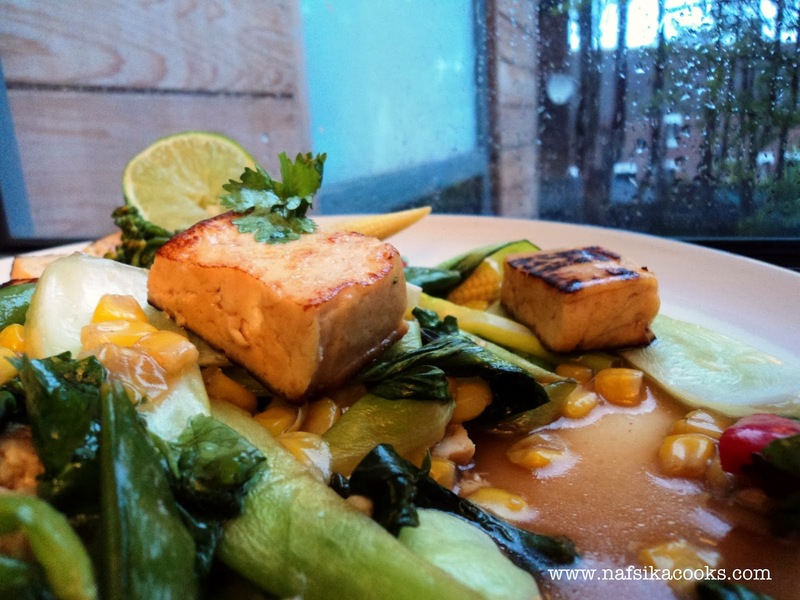 And because I hate the idea of having an ingredient I don’t like, one thing is certain: I will definitely cook tofu again!